2K Sports has released a brand new NBA 2K16 trailer, introducing the “Play Now Online” mode. This year's head-to-head online games matter once again. Wins and losses count toward reaching goals and new league seeds. Rising through the ranks won't be easy. NBA 2K has become the biggest selling video game franchise in the world, and that makes the reveal of player ratings an anticipated tradition for fans. 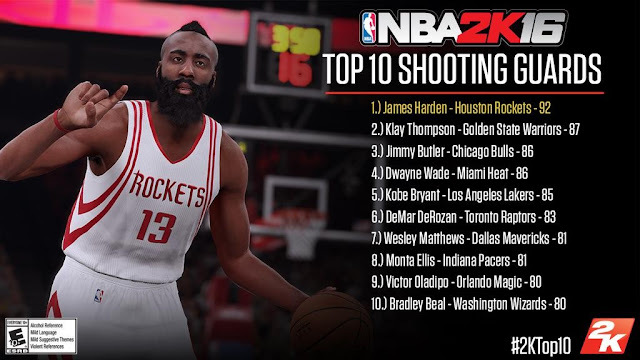 2K Sports has now revealed the top 10 highest-rated players for NBA 2K16. 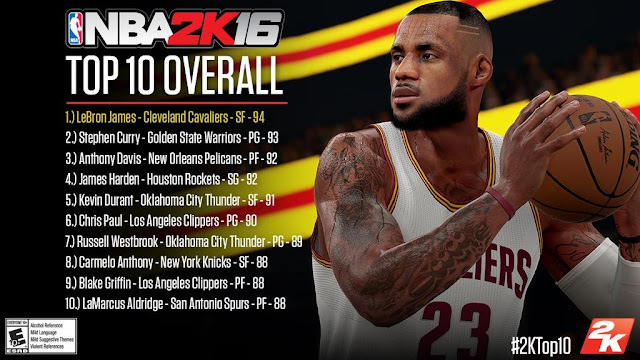 As you might have guessed, LeBron James of the Cleveland Cavaliers sits at the top of the list, with a 94 overall rating. Find out who else made it to the list. 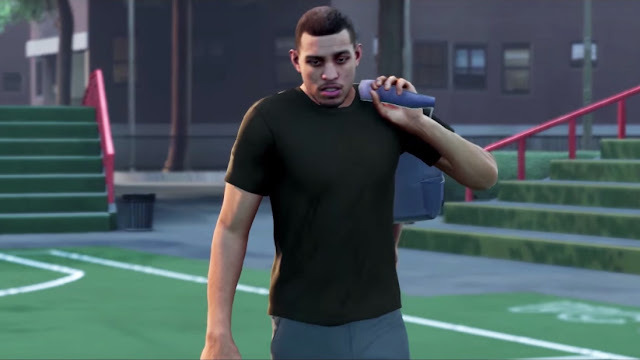 NBA 2K16 is just days away and to celebrate 2K Sports have launched a new trailer to mark the imminent release of the world's most popular basketball simulation. 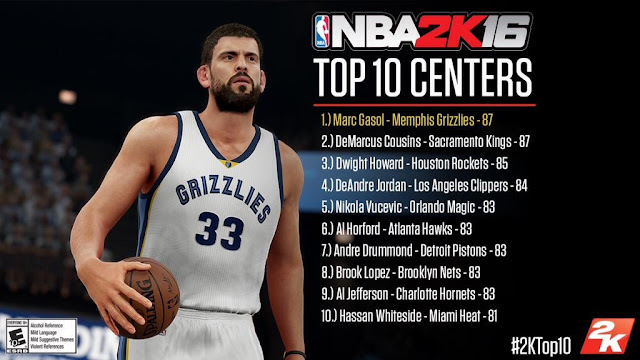 Another batch of player ratings was unveiled as 2K Sports released the top 10 highest-rated players at center position in NBA 2K16. DeMarcus Cousins of the Sacramento Kings and Marc Gasol of the Memphis Grizzlies top the list as both players receive an overall score of 87. Find out who else made it to the list. 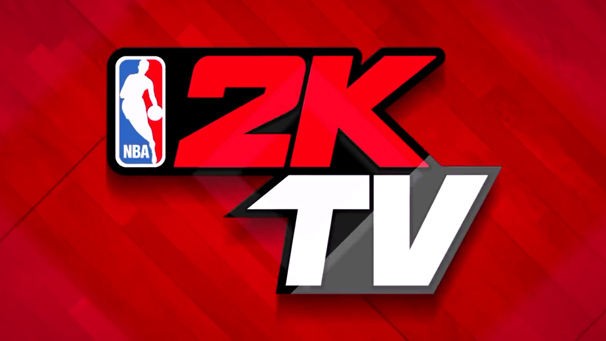 NBA 2KTV is back and better than ever! Check out the Season 2 trailer for a sneak peak at what's to come... 2KTV Interactive, NBA/celebrity exclusives, expert tips and training in NBA 2K16, and so much more! Who's excited? The NBA 2K16 release date is just one week away and we already know the best players at each position. Today we have the list of the highest rated power forwards in the game. 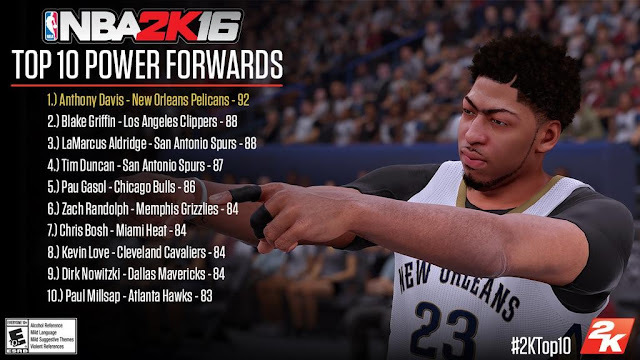 Leading the list, with an overall score of 92, is Anthony Davis of the New Orleans Pelicans. Check out the complete list below. 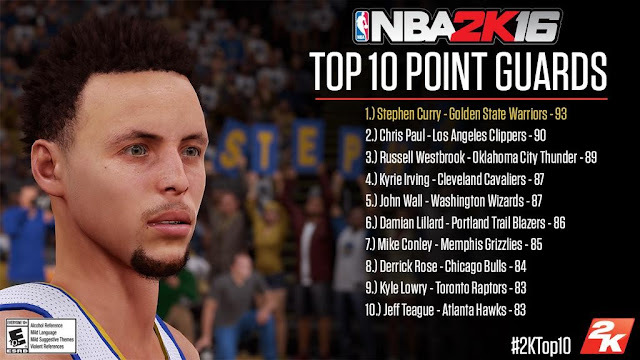 2K Sports has revealed the top rated players in NBA 2K16 by position ahead of the Sept. 29 release. Earlier, the ratings were released for the highest rated point guards and shooting guards in the game. The spotlight now shifts to the small forwards. LeBron James leads the way with an overall score of 94. Check out the complete list below. 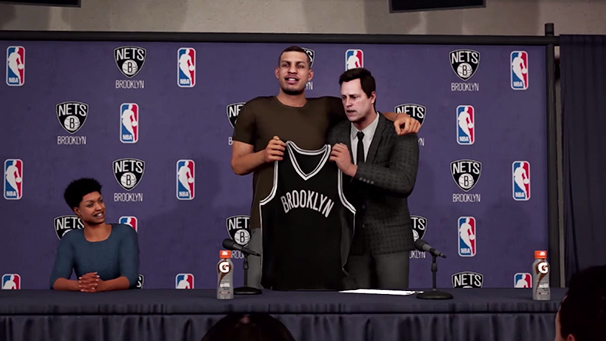 2K Sports has released a brand new NBA 2K16 trailer showcasing what's new in MyCareer mode. Included in the video is a preview of the playable high school and college games. A few new additions are coming to the game. 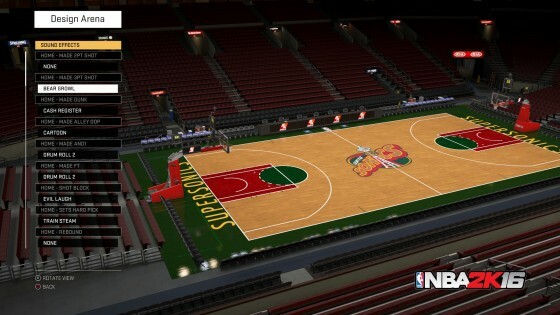 The new features are MyCourt, off-days simulator, and live practice mode. Player customization is one of the defining features of the NBA 2K series. 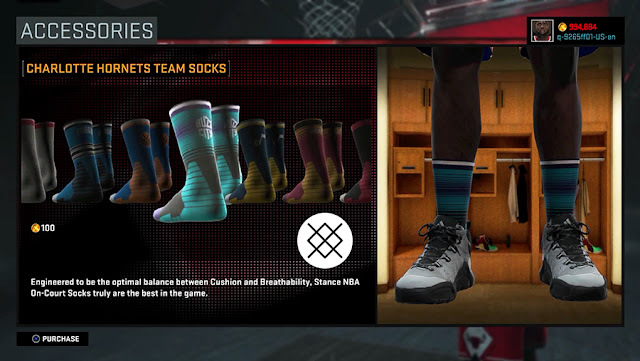 In NBA 2K16, you’ll easily be able to sort through thousands of real life apparel brands, including Nike, Adidas, Jordan Brand, Reebok, Stance, Pigalle, Mitchell & Ness and more! 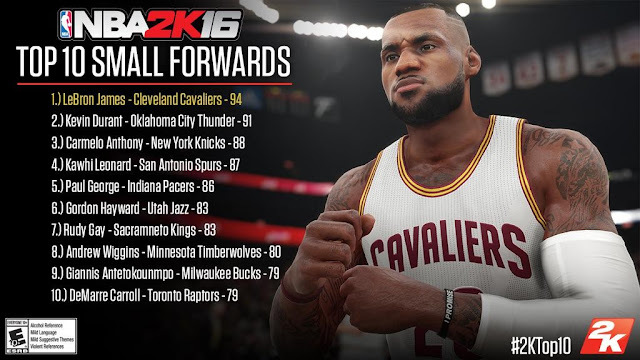 The ratings reveal for NBA 2K16 is in full swing, with 2K Sports detailing the top rated players position by position. Today we have the list of the highest rated point guards in the game. Who sits at the top isn't much of a surprise. In first place, with an overall score of 93, is Stephen Curry of the Golden State Warriors. Check out the full list below. Make sure to pay attention to the height you are setting for MyPlayer in NBA 2K16, as they will determine your physical abilities and limitations. Attribute upgrades will vary depending on your player's height and play style. This year we won't be seeing any 7-foot small forwards that can dribble and run as fast as guards. 2K Sports has just released the newest trailer for the upcoming “NBA 2K16”. Titled “Livin’ Da Dream”, the video gives us an overview of this year's MyCareer mode. With the help of film director, producer and writer Spike Lee, NBA 2K16 aims to bring the game's story mode to life. You may have heard that NBA 2K16 is coming out at the end of this month. If, somehow, you don’t know what it involves, here's a raw gameplay video to give you an idea. It features the defending-champion Golden State Warriors playing against LeBron James and the Cleveland Cavaliers. If you are looking for something that would help you decide whether NBA 2K16 is going to be worth buying or not, here’s a lengthy gameplay video of the Chicago Bulls facing off against the Memphis Grizzlies. Watch the video in 1080p for optimal viewing experience! Here’s a 5-minute long NBA 2K16 gameplay video, which goes into more detail about what players can expect to experience from the game. 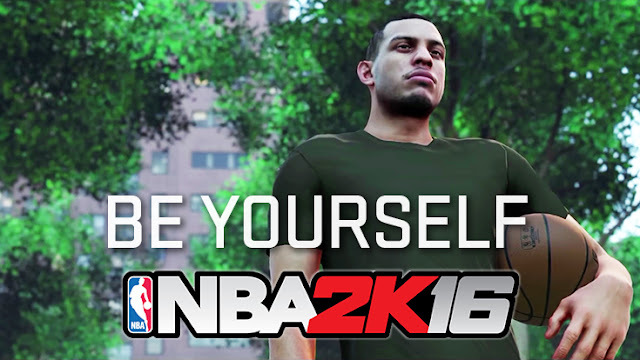 We finally have a full length match from the upcoming NBA 2K16 for you to enjoy. The match is between the Houston Rockets and Los Angeles Clippers. The video is taken from a PS4 console, but will of course represent gameplay for the Xbox One and PC. Watch it below and let us know what you think. 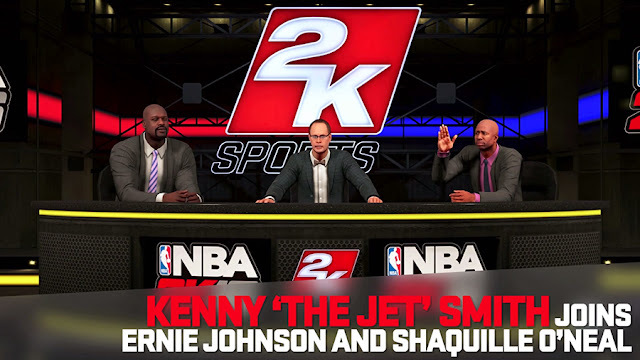 2K Sports has released a new video for NBA 2K16 showing off some of the commentary from Shaquille O’Neal, Ernie Johnson and the new member of the studio crew, Kenny "The Jet" Smith. 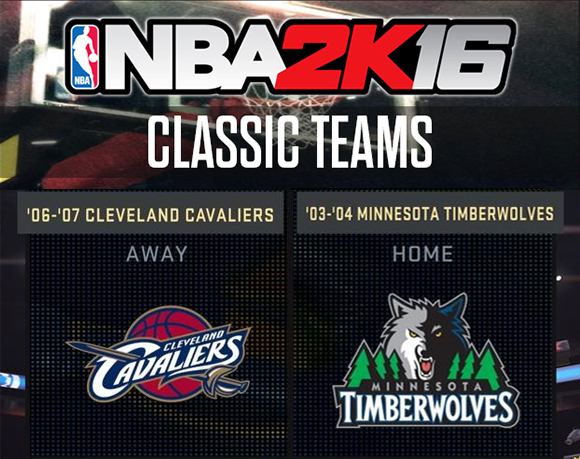 We finally have the full list of newly added classic teams for the upcoming NBA 2K16. The 2003-2004 Minnesota Timberwolves and the 2006-2007 Cleveland Cavaliers are the last two teams that made it to the cut. 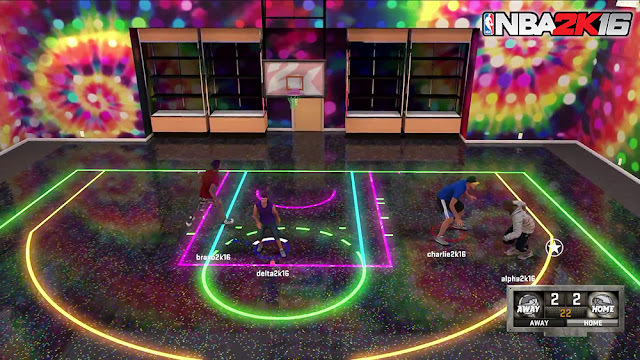 NBA 2K16's development team gives us an overview of the new features and changes coming to MyTeam mode.